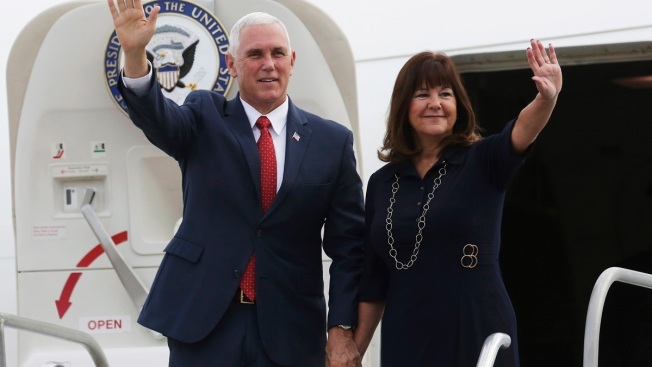 In this June 26, 2018, file photo, U.S. Vice President Mike Pence, left, and his wife Karen Pence wave during their arrival at Brasilia Air Base, in Brasilia, Brazil. Vice President Mike Pence on Thursday addressed news coverage and criticism regarding his wife’s decision to return to teaching at a Virginia elementary school that explicitly bars LGBTQ employees and students, NBC News reported. National news outlets, including NBC News, reported Wednesday on the publicly available employment application and parent agreement of Immanuel Christian School in Springfield, Virginia, where Karen Pence is now teaching art twice a week.